A Ukrainian film-maker on hunger strike in a remote Russian jail is in a “catastrophically bad” state, one of his cousins says. In August 2015 a military court in Rostov-on-Don, southern Russia, sentenced him to 20 years, and he is now in jail in Labytnangi, a small town in Russia’s Arctic north. There is a high-profile campaign in Ukraine demanding his release. He is best known for his 2011 film Gamer. His lawyer Dmitry Dinze visited Sentsov on Tuesday and later said his client had lost 30kg (66 pounds) in weight and his heart rate had slowed. 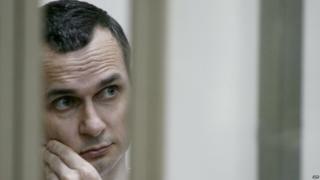 During the trial Sentsov denied the Russian charges, saying that “a court of occupiers cannot be just”. He said members of Russia’s Federal Security Service (FSB) had beaten him up to extract a confession. Russia’s annexation of Crimea and its support for rebels in eastern Ukraine led to a series of sanctions imposed by Western nations against Moscow.